Danielou, Alain: The Raga-S of Northern Indian Music. By Alain Danielou. New Delhi: Munshiram Manoharlal 1980. X, (2), 403 Seiten. 8ºAntikbuch24-SchnellhilfeOktav = Höhe des Buchrücken 18,5-22,5 cm (17,5-22,5 cm). Orig.-Leinenband mit Orig.-Schutzumschlag. [Hardcover / fest gebunden]. "The first part of the book traces the history of Indian music and the continuity of its theory and practice for more than two thousand years. It is based on many years' research into the vast ancient Sanskrit literature of music. These valuable technical treatises, which lie in the form of scarcely catalogued manuscripts throughout the public and private libraries of India, had hitherto remained unexplored. Part two transcribes and studies in detail 50 typical Raga-s. Each is preceded by a Sanskrit poem in translation which depicts the atmosphere; then follow an analysis of the scale, covering its intervals and expression, a study of the theme with its characteristic motives and finally a typical development. [...]" - Dust jacket with light edge and cover a bit dusted, else in good condition. Daniélou, Alain: Die Musik Asiens zwischen Missachtung und Wertschätzung : ein Beitr. z. Problem kultureller Entwicklung in d. Dritten Welt. In Zusammenarb. mit Jacques Brunet. Aus d. Franz. von Wilfried Sczepan. [Internat. Inst. f. Vergleichende Musikstudien u. Dokumentation, Berlin] / Taschenbücher zur Musikwissenschaft ; 8 Wilhelmshaven : Heinrichshofen, 1973. 137 S. 18cm, Softcover/Paperback ISBN: 9783795901653 Buch ist in gutem Zustand. Danielou, Alain Südasien. Lpz. Dt. Verl. 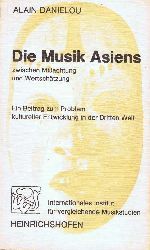 f. Musik 1978 Die indische Musik und ihre Traditionen. Musikgeschichte in Bildern: Band 1: Musikethnologie; Lieferung 4 4ºAntikbuch24-SchnellhilfeQuart = Höhe des Buchrücken 30-35 cm; 146 S. Mit zahlr., überwieg. s/w Abb.Antikbuch24-SchnellhilfeAbb. = Abbildung(en) Ln.Antikbuch24-SchnellhilfeLn. = Leineneinband, farb.-illustr. SU, guter bis sehr guter Zustand 1. Aufl. 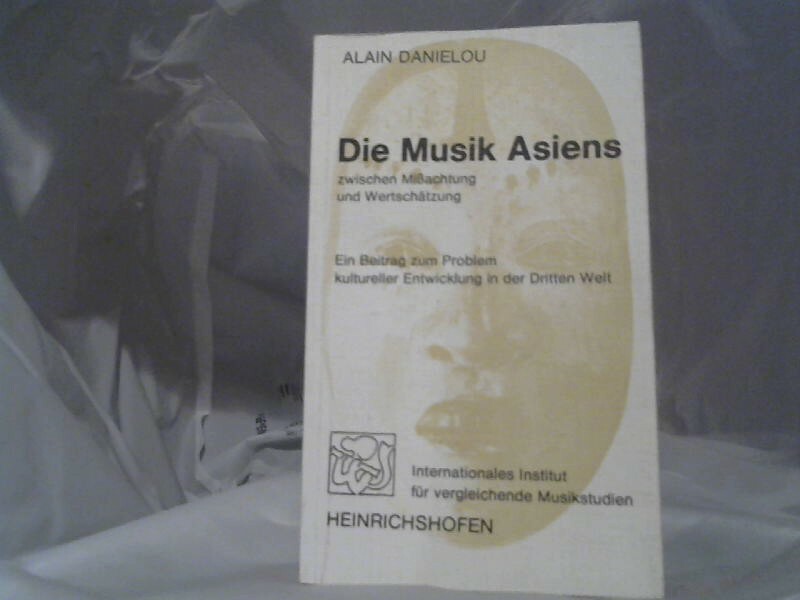 Danielou, Alain Südasien - die indische Musik und ihre Traditionen - Musikgeschichte in Bildern. Deutscher Verlag für Musik Leipzig. 1978 Quart. 146 Seiten. Leinen mit Umschlag. im Pappschuber, dieser nachgedunkelt und mit kleinen Randläsuren, Umschlag mit kleinen Randläsuren. Musik, Tanz, Literatur, Music, dance, literature, English. Yehudi Menuhin, Alain Danielou, J. H. Kwabena Nketei, Tran Van Khe....: Artistic Values in Traditional Music. Proceedings of a Conference held in Berlin from the 14th to the 16th July 1965. (in Englisch) Holland. Peter Crossley. 1965. (Internationales Institut für vergleichende Musikstudien und Dokumentation.) 1st edition, 126 pages. Quart - 4 °. Original plastic. 1. Aufage, 126 Seiten. Quart - 4ºAntikbuch24-SchnellhilfeQuart = Höhe des Buchrücken 30-35 cm. Original-Plastik. Font print of another book on cover, otherwise in good condition. Schriftabdruck von anderem Buch auf Einband, sonst in gutem Zustand.